The Cuisinart CPT-3000 is a 2-slice glass toaster which enables to see-through windows on both the front and back of the toaster. It has touchscreen controls which offer 6 shade levels and presets for defrosting items or toasting bagels. The other highlights include quartz toasting technology for rapid and even results with stainless steel housing and has high-lift carriage. The Cuisinart Glass 2-Slice Toaster has many exciting features for users of all types. You can extend the lifetime of your Cuisinart Glass 2-Slice Toaster with the purchase of a FactoryOutletStore Factory Protection Plan. See the Cuisinart Glass 2-Slice Toaster gallery images above for more product views. 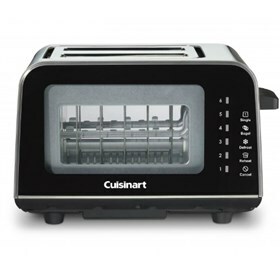 The Cuisinart Glass 2-Slice Toaster is sold as a Brand New Unopened Item.